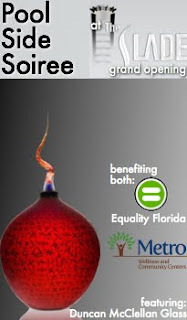 Please join us May 22nd, 7-9PM for a Pool Side Soiree at the new Slade Condominiums in downtown Tampa. Tickets are just $25. Click here to purchase now. Only 125 tickets will be sold and 100% of the proceeds will be divided between Equality Florida and Metro Center. So join us under the stars around the spectacular infinity pool at The Slade of Channelside. Sip on beverages of your choice, including: beer, wine, or the evening’s signature drink, raspberry lemonade martini (one complimentary beverage per guest). Enjoy the phenomenal menu, featuring ahi tuna nachos, stuffed teriyaki beef & chicken hibachi, duck & lamb canapes, hoisin glazed rack of lamb lollipops, barbecue scallops wrapped in bacon, shrimp cocktail shooters and maryland crab cakes. And to accompany the fine food, fine art. Outings & Adventures, our event coordinator, has arranged for two of the Slade’s model units to be decorated with Duncan McClellan Glass!